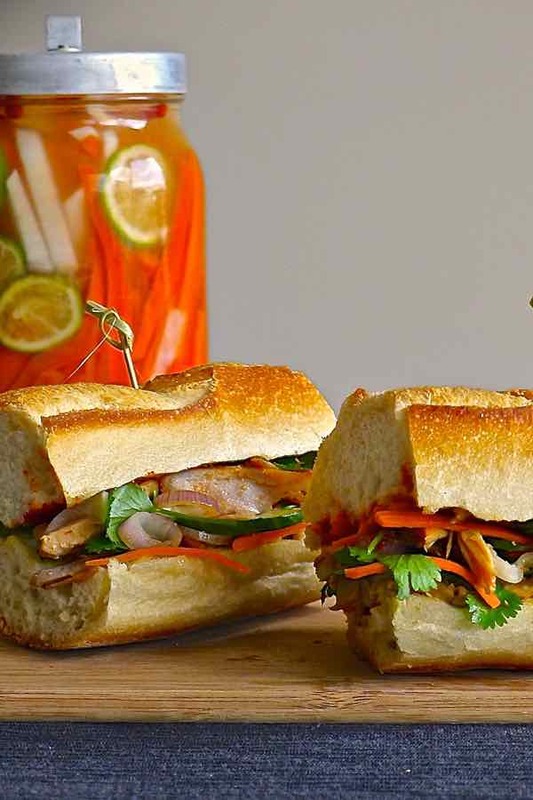 Today, we are headed to Vietnam for the recipe of the ultra popular banh mi sandwich! A quick lunch? A picnic? Or a lunch box for your little darlings? We are talking about sandwiches. 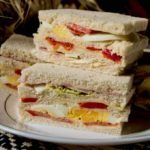 What is the history of sandwich? It is known that we owe the sandwich to John Montagu, the fourth Earl of Sandwich. However, the origin of this bread-based preparation seems to be much older. So how were sandwiches called before being called… well, sandwiches? Before the Earl of Sandwich gave his name to posterity? The first sandwich was invented a century before the Christian Era, in the days of Herod the Great, by famous Rabbi Hillel the Elder (הלל הזקן), one of the most important figures in Jewish history. During Passover, he had the idea of ​​combining a mixture of nuts, apples, spices and wine between two matzots (unleavened bread), with bitter herbs to remember the exodus from Egypt told on Passover eve, a sandwich called korech. Already in the Middle Ages, from the sixth to the sixteenth century, thick slices of coarse bread served as plates. People would place meat or other foods on top that was eaten with fingers or with knives only. These slices of bread would completely absorb the meat juices and fat. Until the birth of John Montagu, sandwich seemed to be known as “bread and meat” or more rarely “bread and cheese”. You can actually find these two terms throughout the English theater of the sixteenth and seventeenth centuries, including Shakespeare plays. 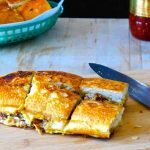 What is the origin of Vietnamese banh mi? 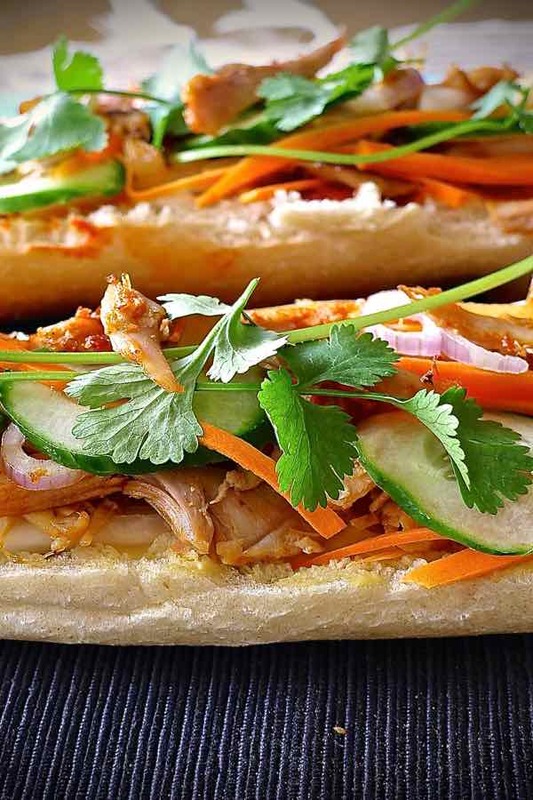 Today, I am headed to Vietnam to introduce you to a very popular sandwich called bánh mì. 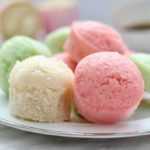 Banh mì (banh for “cake or biscuit” and mì for “flour”) is the name given to Vietnamese baguette bread prepared with wheat or rice flour. Banh mì or banh mì sandwich is also became the name of this typical sandwich. 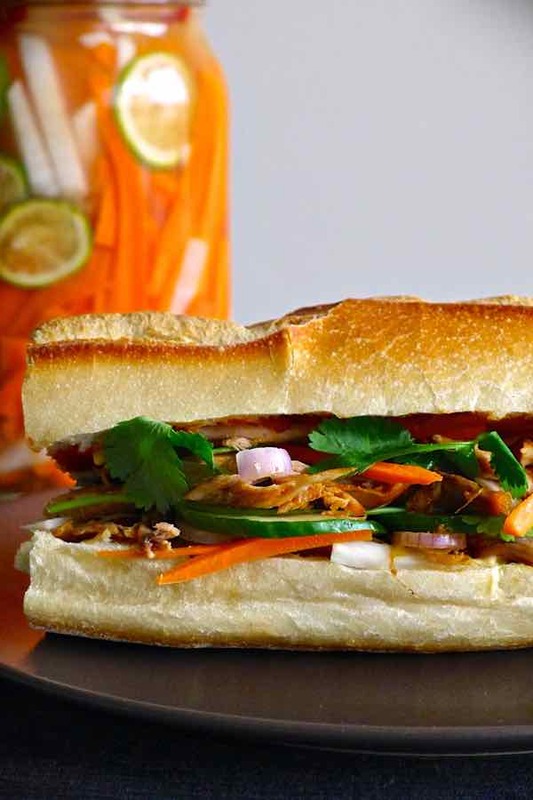 Banh mì sandwiches are originally from Saigon (now Ho Chi Minh City). 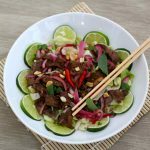 They are prepared with a loaf of crispy bread, sweet and sour pickled vegetables and roast meat, garnished with lots of fresh and crisp cilantro and chili. In Vietnam, those sandwiches are known as bánh mì kẹp or bánh mì Sài Gòn. We owe this cooperation between Asian and French cuisine to the legacy of the French presence in Vietnam. 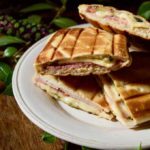 After the withdrawal of French troops in 1954, the Vietnamese began to adapt the French sandwich to the tastes of the country. 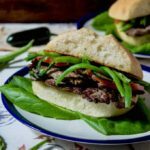 I chose the banh mi version with marinated chicken but there are several versions: beef and pork, steamed, grilled and marinated as well as a version that I will definitely try next time with chicken liver paté. My son Alexandre and I loved this Vietnamese banh mi sandwich! Such an experience! 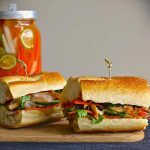 Vietnamese banh mi consists of a loaf of crispy bread, sweet and sour pickled vegetables and roast meat, garnished with fresh cilantro and chili. Place vegetables and slices of lime in a jar, pour in the vinegar and water and marinate overnight or at least 8 hours in the refrigerator. This preparation can be kept four weeks in the refrigerator. Flatten chicken with a meat tenderizer and cut into strips. In a bowl, mix the lemon, sugar, shallots, fish sauce, soy sauce, sesame oil, canola oil, garlic and pepper. Add chicken and coat completely. Pour chicken and marinade on a cold pan. Cook over medium/high heat for 10 minutes, stirring regularly. Open the baguette in half and spread the aioli on one side and the Sriracha sauce on the other side. Top with chicken and vegetables. Finally garnish with slices of cucumber and cilantro. Great, try a shrimp one too. There is a restaurant on Magazine Street in New Orleans called Miss Lilly. Great Vietnamese Food in an old shotgun style house.